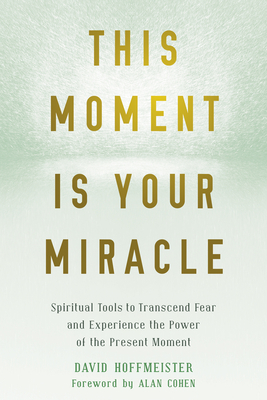 Written by a world-renowned teacher of A Course in Miracles, this book reveals the profound power of the present moment and shows how tapping into it using practical insights and simple exercises can fortify your spirit against fear, break down perceived limitations and your sense of separation, and help you manifest a life of joy, oneness, and serenity. We all feel isolated and afraid sometimes, but the truth is, we're never really alone. Indeed, as author and spiritual teacher David Hoffmeister points out, it is the deeply ingrained belief that you are separate from everything--that you're on your own, there is reason to be afraid, and you might not be worthy--that prevents you from living the joyful life you long for. So, how can you begin to untangle the thoughts and feelings that keep you trapped in your own egoic fears? This Moment Is Your Miracle addresses this painful yet widespread belief in separation, peeling back the layers of misperception to uncover the divine oneness at the heart of reality, through which we are all connected. You'll find spiritual practices and tools to help you awaken from the nightmare of fear and isolation, and practical ways to cultivate acceptance, forgiveness, healing, and trust--for healing yourself, your relationships, and the world. With this book as your guide, you'll learn how to trust your inner guidance and accept life's miracles, and find true freedom and peace of mind. There has never been a better time than now. Internationally renowned spiritual teacher David Hoffmeister is a modern-day mystic and living demonstration of the non-dual path of A Course in Miracles. Highly inspired by Christian mysticism, Advaita Vedanta, and the desire of many to live a life of devotion, communities have sprung up around the world that follow Hoffmeister's very practical Awakening Mind teachings. His teachings are for everyone, and he spans all traditions by utilizing common ground like movies as modern-day parables and the shift in scientific theory from the Newtonian to quantum world view. Foreword writer Alan Cohen is author of twenty-four inspirational books, including the bestseller The Dragon Doesn't Live Here Anymore, the award-winning A Deep Breath of Life, and the classic Are You as Happy as Your Dog? He is a contributing writer for the #1 New York Times bestselling series, Chicken Soup for the Soul, and his books have been translated into twenty-four foreign languages. His work has been featured on www.oprah.com, and in USA Today, The Washington Post, and 101 Top Experts. Alan's radio program, Get Real, is broadcast weekly on Hay House Radio, and his monthly column, From the Heart, is featured in magazines internationally.